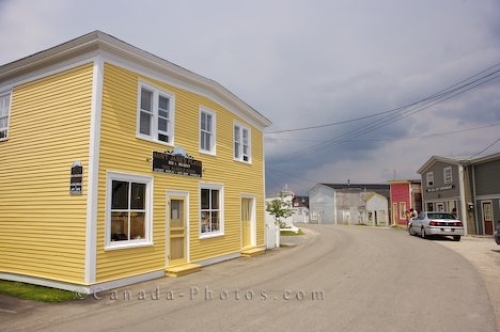 The historic buildings along the street in Woody Point in Gros Morne National Park in Newfoundland, Canada are unique and the yellow one is home to a bed and breakfast as well as a gift shop. Known as Aunt Jane's Place Bed and Breakfast, there are five rooms in this historic building which are offered to travelers at a reasonable price. In the same building, there is a gift store called The Sample Room Gift Store which has a selection of antiques and specialty items from your trip to Woody Point. The town of Woody Point is a historic area in the centre of Gros Morne National Park which has a scenic waterfront and a variety of heritage buildings. There are various attractions for visitors to see while in Woody Point, a short list being the heritage walk, walking trails, the heritage theatre, St. Patrick's Church, the Gros Morne National Park Discovery Centre, the lighthouse and the cemetery. Picture of the historic buildings along the quiet street in Woody Point in Gros Morne National Park in Newfoundland, Canada. The first settlers to arrive in Woody Point was in 1849 which grew considerably to about 129 families by 1872. By 1922, Woody Point was at the peak of its economy and population, but a fire devastated the town and demolished 58 of the historic buildings. Today, visitors to Woody Point, Newfoundland will find many of the buildings were constructed after 1922 with a few select ones still dating back prior to that. Aunt Janes Place Bed and Breakfast and The Sample Room Gift Store, Woody Point, Gros Morne National Park, UNESCO World Heritage Site, Viking Trail, Trails to the Vikings, Highway 431, Northern Peninsula, Great Northern Peninsula, Newfoundland Labrador, Newfoundland, Canada.